In late 1858 the post office decided to begin perforating stamps to facilitate quick and accurate separation. It was decided that the 1/2d, 3d and 6d values of the erlier pence issue would be issued thus, the 12d, 10d and 7.5d values being discontinued. 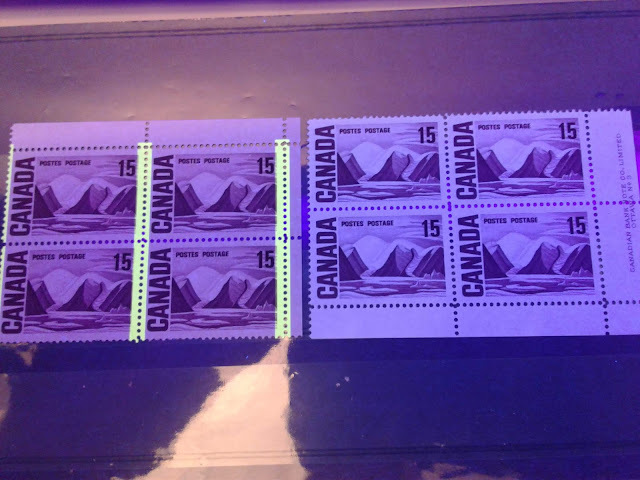 The perforation used measures 11.75 on all sides. Like the previous pence issue, there are interesting shades to be found. The 1/2d comes in the rose and lilac rose shades, the 3d in red and brown red, and finally the 6d in brown violet and grey violet. In addition the usual re-entries that are found on the 1/2d and 3d imperforate stamps are also found on this issue, as the same plates were used to print these stamps. In addition, stitch watermarks have been reported on the 3d and 6d. These are very rare. Finally, the 6d exists bisected diagonally on cover. This is an extreme rarity, cataloguing $25,000 in the 2014 Unitrade catalogue. This is actually much better than average centering, as the perforations only just cut the outer frameline at the top left corner. Everywhere else, they just touch or clear the frame. How about giving a short explanation of how stamps are quantified with respect to quality. When you say "VG is the average grade for this issue"; what does that mean? How would you explain what you look for to someone like me who looks at these and goes "Purdy"? Thanks Dale. That is an excellent point. I have added two links to the pages of my store where I offer a complete explanation of my grading system.